This is a qualifying show for the British Arabian Championships to be held on 7th & 8th September 2019 at Kings Equestrian Centre, www.kingsequestrian.co.uk. 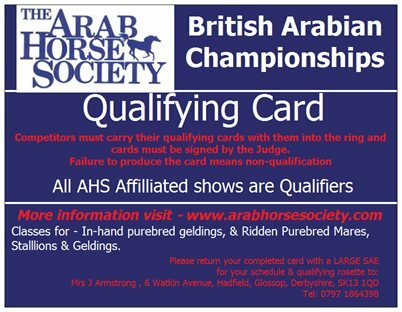 All details and Qualifying Cards from The Arab Horse Society, Agriculture House, Charnham Lane, Hungerford RG17 0EY Tel 01672 555515 Please send a S.A.E. Cards are £15 each. Please state horse’s name, age and section when applying for a card. Cheques payable to The Arab Horse Society. Gold Qualification cards will also be given to 1st and 2nd prize winners.